The porter style of beer was created in London around 1700, and is considered the world's first industrialized beer (hence the name). I first had this beer a while ago, but I decided it was time to revisit it for a new review & pic. After an aggressive pour, the head is decent, albeit short-lived. It leaves next to no lacing on the way down. The beer is a very dark brown, with chestnut highlights around the edges. It has a strong aroma - dark coffee, dark chocolate... it's a rich, roasted, and slightly sweet smell. It tastes like a beer that has a higher alcohol content than 5%. There are traits about it that almost remind me of a stout or milk stout... sweetness, bitterness, almost a fruity tart quality. The BJCP and World Beer Cup divide porters into two categories: "robust" and "medium". This would definitely be in the latter. For how it tastes and smells, I expect something with more body to it. The mouthfeel on this is fine, but thinner than I think it should be... or wanted it to be, I suppose. On the plus side, that makes it fairly sessionable. Overall, a pretty good beer. 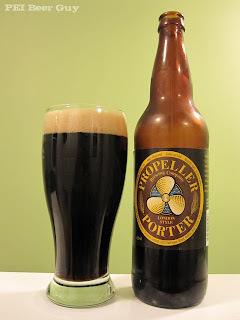 Propeller Porter was definitely my favorite and most memorable beer from my honeymoon East in 2008. It takes great effort to import Propeller products into Manitoba, but I will taste that porter again. Propeller can definitely make some good stuff. My favourite Propeller memory is drinking water from their bottles on set when I got to be an extra on The Trailer Park Boys. Water in beer bottles on a show like that... who woulda thunk it? Thanks for commenting!